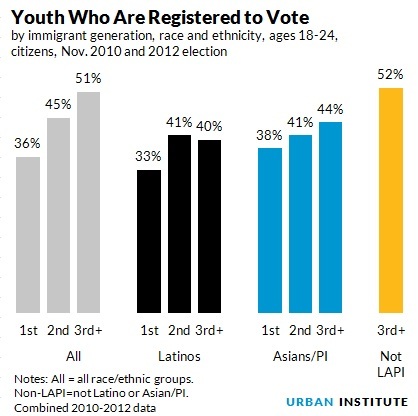 Will immigrant youth vote in the upcoming election? On November 4, millions of Americans will go to the polls to cast their votes. Most immigrant youth will stay home. One in every four Americans ages 18 to 24 was either born abroad or born in the US to immigrant parents. These first and second generation youth—over 7.5 million in all—are fueling population and labor force growth in the United States. They are also less likely than their nonimmigrant counterparts to be registered to vote and less likely to go to the polls. In my report “Immigrant Youth Outcomes: Patterns by Generation and Race and Ethnicity,” I compare voting patterns of immigrant and nonimmigrant youth (defined here as ages 18 to 24). Most people can trace their history to an immigrant, so to get closer to a comparison group with no recent ties to immigration, nonimmigrants are defined here as third-generation Americans who are not Latino or Asian/Pacific Islander. Among first generation immigrant youth who are US citizens and therefore can register to vote, only a third are registered, compared with 52 percent of nonimmigrant youth. Registration increases from first to second generation youth, but the second generation, all of whom are citizens, remains 7 percentage points less likely to be registered than nonimmigrants. Among Latino immigrant youth, the third generation (those born in the United States to US-born parents) takes a U-turn in voting behavior. The share of Latino youth who votes increases from the first to the second generation, but the third generation is less likely to vote. Terrain that was gained from the first to second generation starts to erode with the third generation: 28 percent of second generation Latinos voted in the past two national elections, but only 24 percent of third generation Latinos did so. Having only 6 percent of first generation youth voting and seeing the U-turn in the voting pattern of third generation Latinos forces us to face some serious questions. Who gives voice to first generation immigrant youth when only 6 percent of them vote? Can the American Dream of the immigrant narrative be achieved while remaining detached from the most emblematic of American democratic institutions? Certainly some first generation immigrants are students and will leave the United States when their studies are over, but most are here to stay, possibly without legal residence and have no way to put themselves on a pathway to citizenship and, eventually, to voting. The U-turn of third generation Latinos from voting is even more unsettling. As US citizens of US citizen parents, they grow up exposed to American institutions of democracy, yet they do not like what they see in the political process and withdraw. These findings—and the large share of immigrant youth in the country—make a strong case for thinking about what can be done to engage immigrant youth in the political process; ensure their interests are represented in political campaigns; and involve them in other, nonvoting forms of civic participation.